I have many open-mesh OM1P units laying around from failed wireless projects. Needless to say I’m not a big fan of open-mesh and have some other projects in mind for this hardware. It was a painful process but well worth it. Now I have nice little OpenWRT units for any hacking pleasure. I have made a concise synopsis of the openwrt wiki page for flashing proper firmware on the OM1p/Fon/Fonera/Accton/etc. 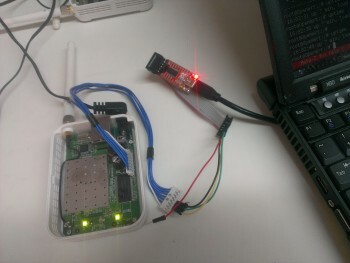 Please visit http://wiki.openwrt.org/toh/fon/fonera#openwrt for more detail. Use minicom or screen to access it. We need a tftp server (don’t worry its super easy if your using Debian :-). I tried with http (apache) and it doesn’t work. On the om1p, in RedBoot, run the following commands. You will see OpenWRT booting and creating filesystems and such. Now we need to set a heartbeat for the hardware watchdog otherwise the om1p reboots every 5 minutes. Start NM again, you will now get an ip from the om1p openwrt dhcp server. yay, no more crap open-mesh!